Just a quick post for an easy pork and sauerkraut. It was nice to come home and have dinner ready after a busy day at work. 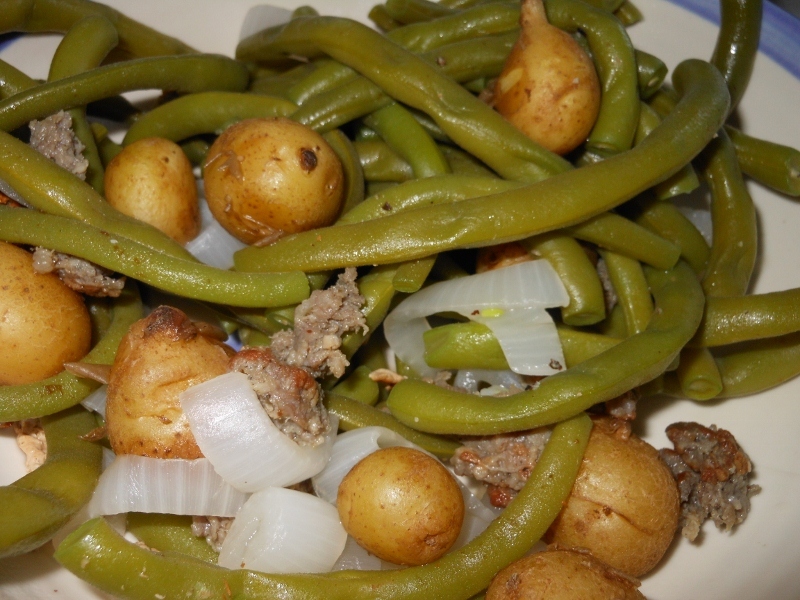 Place potatoes in bottom of slow cooker. Next add pork and seasonings. Cover with jar of sauerkraut and cook on low for about 7 hours. 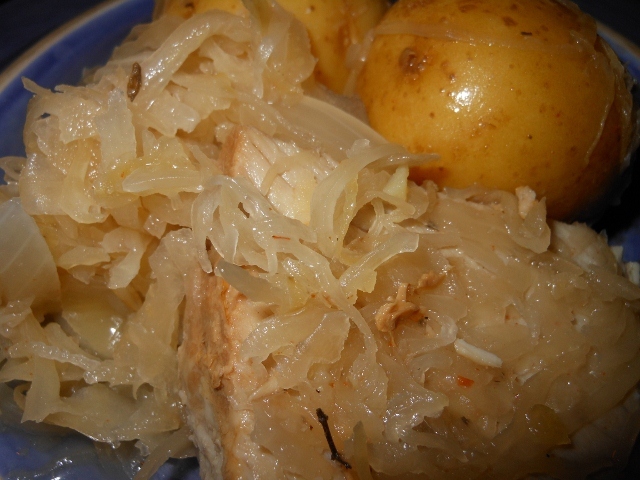 I had plenty of left over pork roast from the other day and thought pork and sauerkraut sounded delicious. This is a quick and easy version; my pork was already cooked so it didn’t need much time at all. Begin by draining the sauerkraut liquid into large stock pot. Add baby potatoes to pot and add enough water to cover. Bring to a boil and cook for 20 minutes. 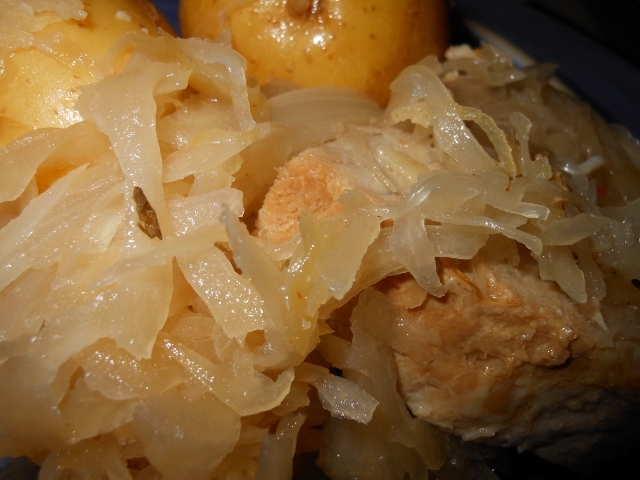 Add sauerkraut and chunks of pork bring to a simmer and cook another 10 – 15 minutes until potatoes are cooked through. I stopped by our little local farmers market and found a few goodies today. One of which was some fresh picked green beans. We planted ours a bit late and although they are blooming I’m waiting for some beans to grow so I was glad to find these today. I remember when we were kids mom would cook them for what seemed like hours. I’ve found as I’ve gotten older I like them quickly cooked. Don’t get me wrong I love some canned green beans so there is nothing wrong with cooking for a while, but when the opportunity presents itself I like to give them a reasonably quick cook. Different varieties make a difference too. I am sure these were the usual blue lake variety most farmers around here grow. I’m personally fond of the jade variety but these hit the spot and as soon as mine are ready I will be able to sauté, grill and even fry up some jewels! Today though I went for a homestyle cook with a bit of this and that. Vary the recipe with what you have on hand. I happened to be cooking some sausage for breakfast so I kept a tablespoon or two of meat and the drippings from the pan to add the green beans but ham or bacon will be fabulous as well. 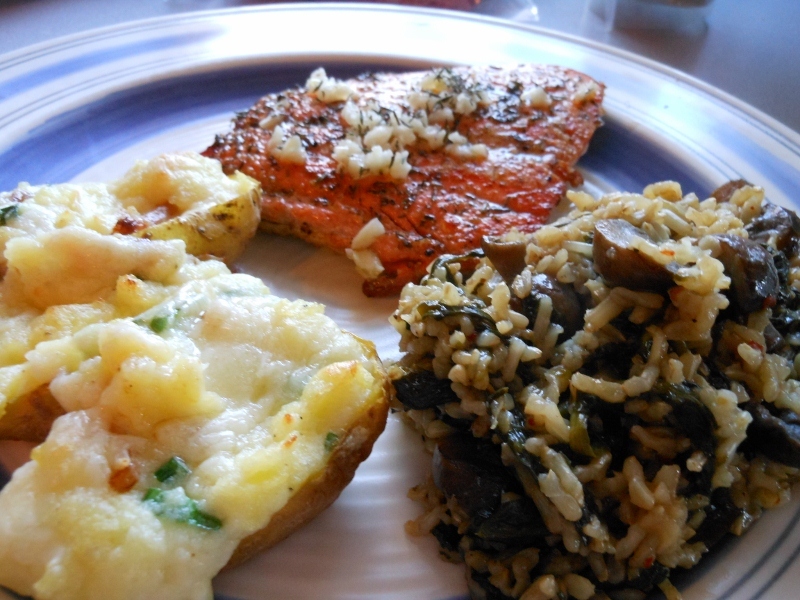 Even a meatless dish is tasty too just adjust to your liking. Wash and trim ends of green beans. Place all ingredients in pan and bring to boil over medium high heat. 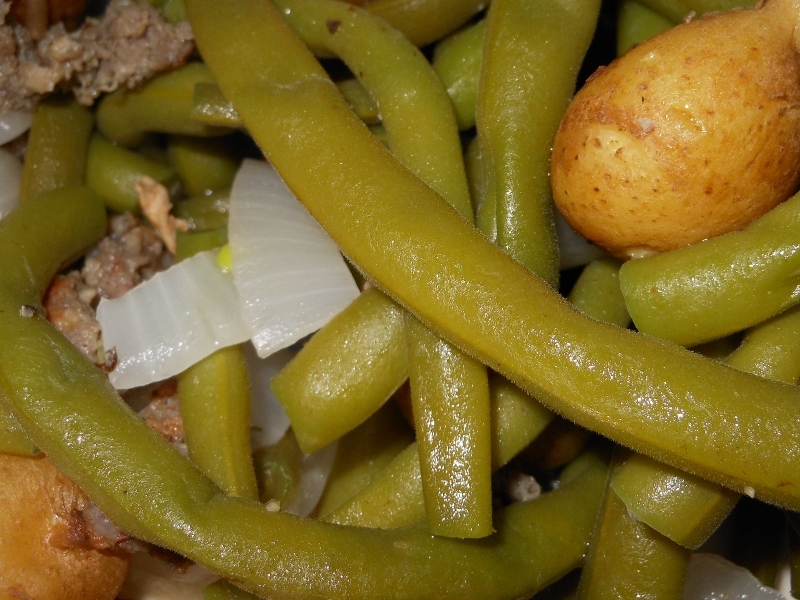 Reduce to medium and simmer 15 minutes until green beans are tender and potatoes are slightly soft. 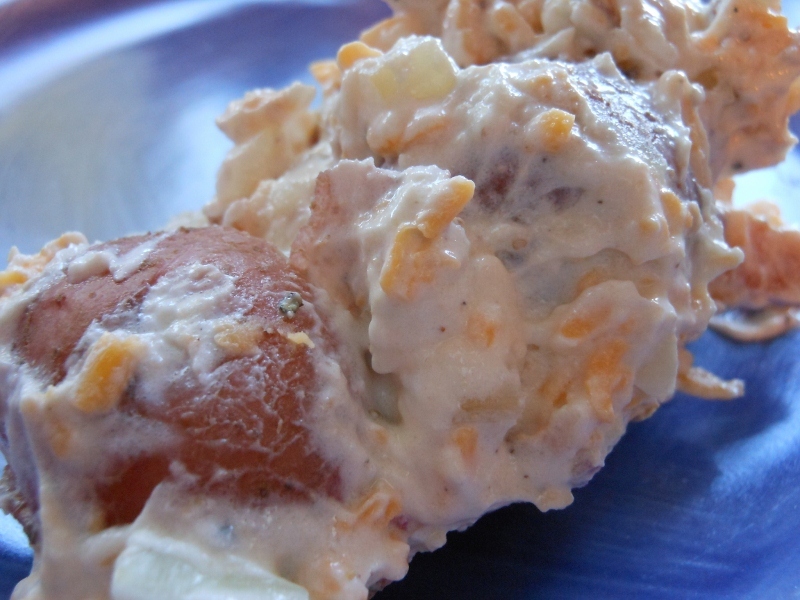 There are hundreds of ways to make potato salad; I couldn’t even begin to guess which is my absolute favorite but this one came out quite tasty. It would even work well warm. Based on a loaded baked potato I took some new baby potatoes I found at the farmers market today and gently boiled them and added in all the yummy ingredients. The only thing I lacked today was green onion so I used a little Vidalia I had. The green onion is a better choice I think; plus it would have added a bit of needed color with the green. Delicious either way! 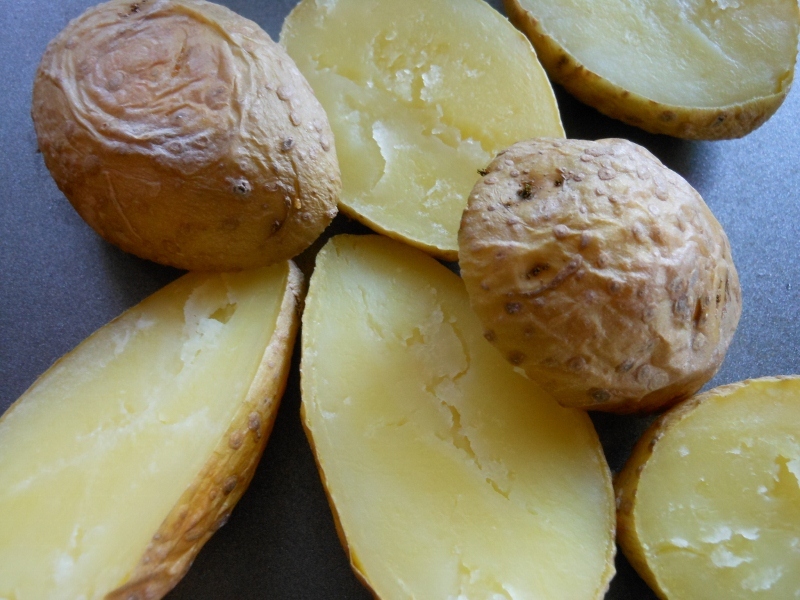 Cut potatoes in half or quarters as needed to make them large bite size. Cover with water and bring to boil. Reduce heat and cook 8 – 10 minutes until tender. Drain and rinse with cool water. Refrigerate until chilled a bit. Add remaining ingredients and stir. Check for seasoning and creaminess. I ultimately added another 1/4 cup sour cream but test before adding. 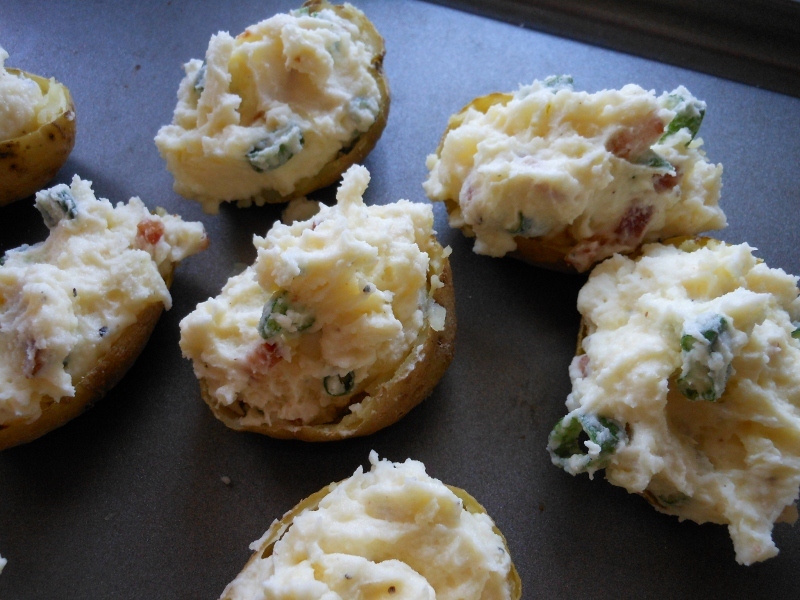 We wanted to try some little twice baked potatoes today. 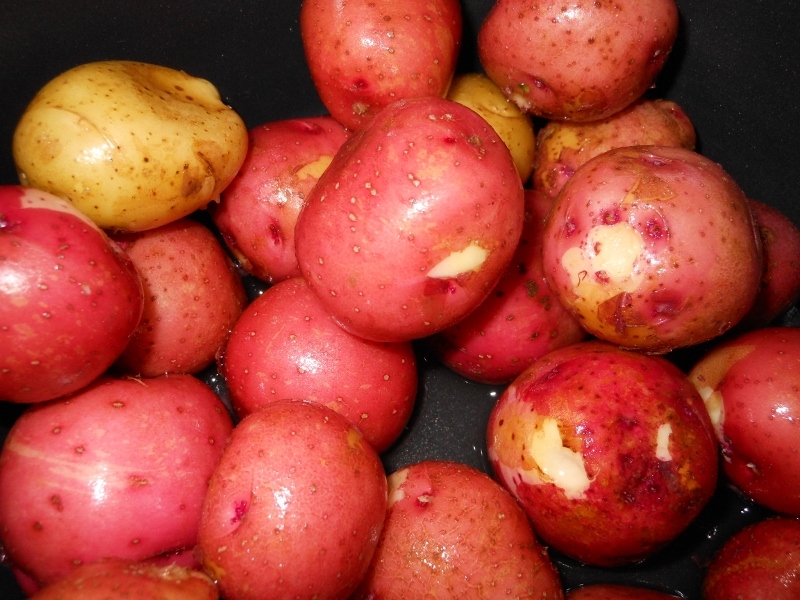 I saw a picture using baby red potatoes but couldn’t find any I liked the looks of at the grocery so I picked out some baby Yukon gold potatoes instead. These were very tasty. 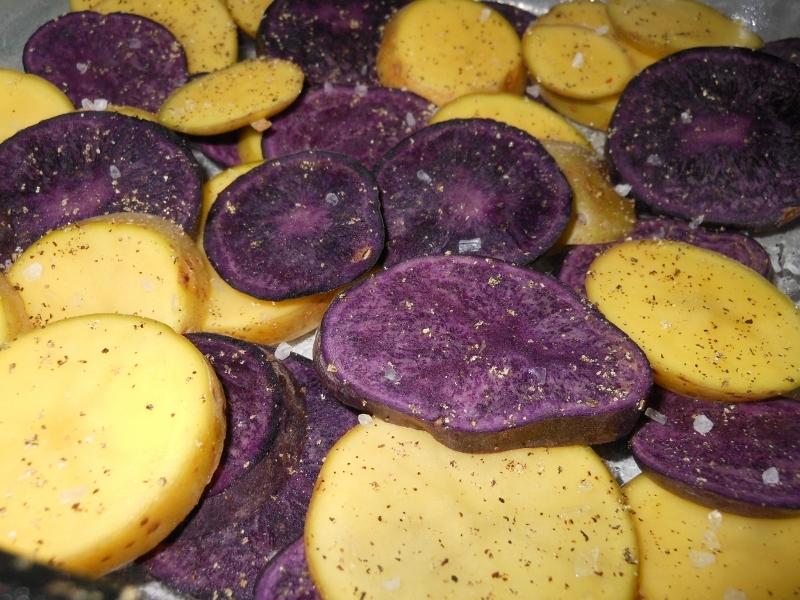 Larger potatoes will work too or use your favorite ~ I’m anxious to try this with those purple potatoes I pick up from time to time just to see how the color turns out! Start by baking your potatoes. I used a 350 degree oven for about 45 minutes. 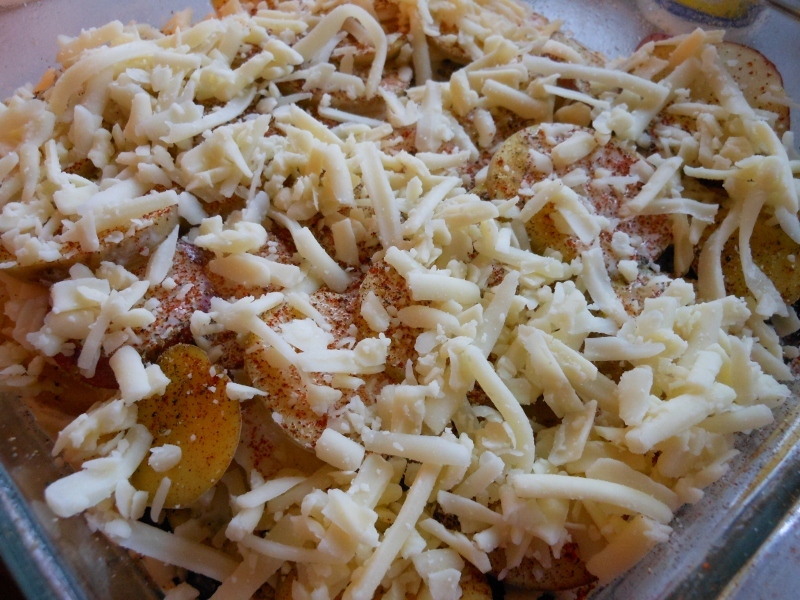 Once potatoes are tender remove from oven. Allow to cool for a few minutes so they are easier to handle. Cut in half. 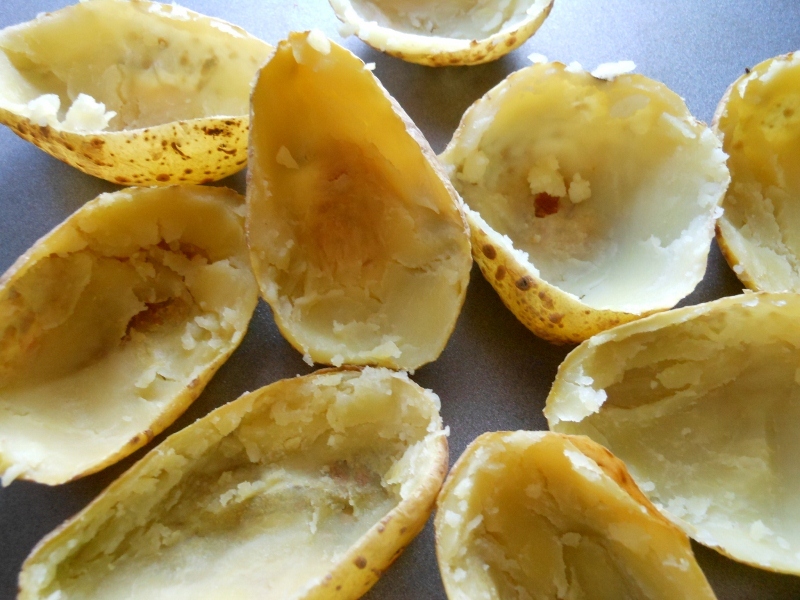 Remove as much of the potato from the skin as possible. I yielded about a cup of potato from the 6; adjust the measurements as needed if you have more or less potato from your skins. Add butter and cream to the potato pulp; mix well; when I first added the cream it seamed soupy but everything pulled together as I continued to stir. Stir in sour cream and remaining ingredients. Fill shells with mixture. My shells were full and overflowed when I baked them. This could have been prevented if I’d used small baking dishes to keep them upright better or used less filling; of course the filling is the good stuff so I didn’t mind them overflowing. sprinkle with additional cheese if desired. Bake at 425 degrees for about 10 minutes; broil for about 5 additional minutes to brown the tops. 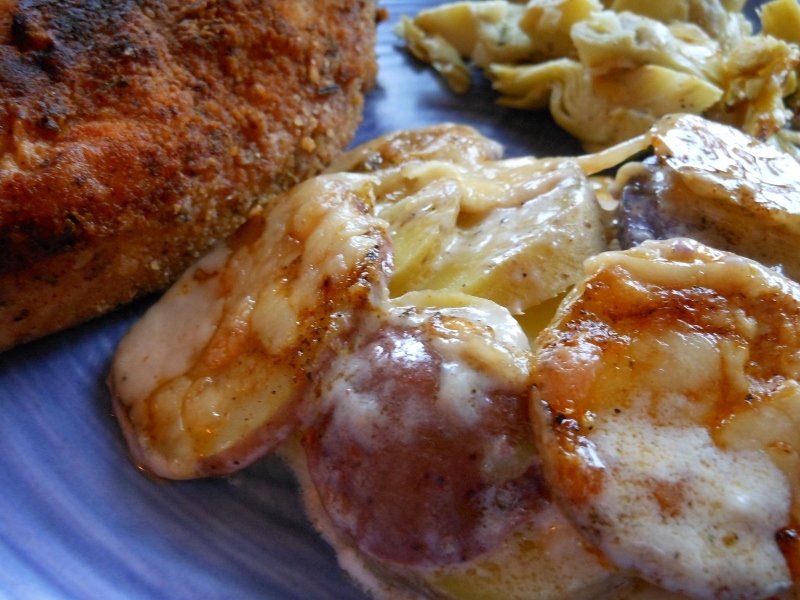 Scalloped Potatoes ~ quick and easy; creamy and cheesy! 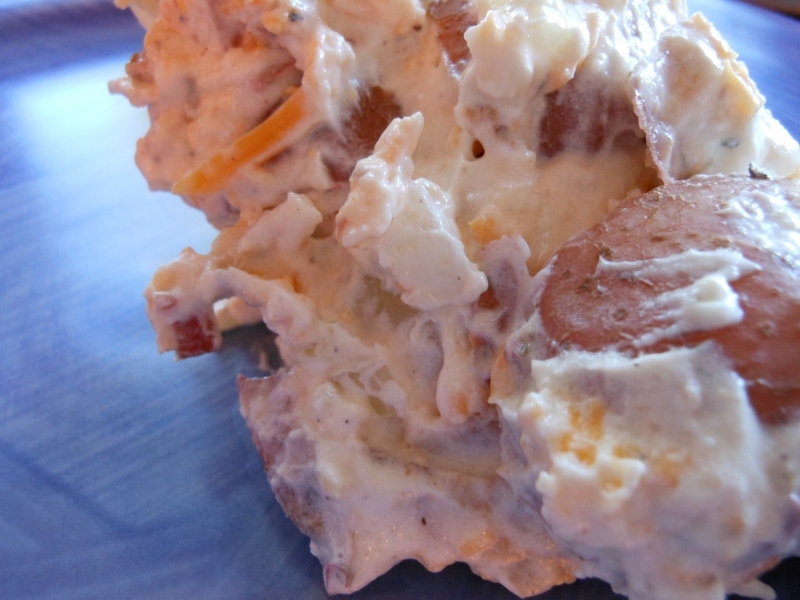 This is one of those recipes that I am still tinkering with. I like the minimal ingredients ~ basically 3 ~ and the ease of construction is a plus. I really am not sure how I would change what I made today; perhaps a little less cream or a little longer cook time. Although I found the extra sauce on my plate was perfect for dredging my fried chicken through so there wasn’t a drop left and to me the potatoes were cooked to perfection (not too mushy) so I would hesitate to cook longer. Anyway, here’s the recipe ~ give it a try! 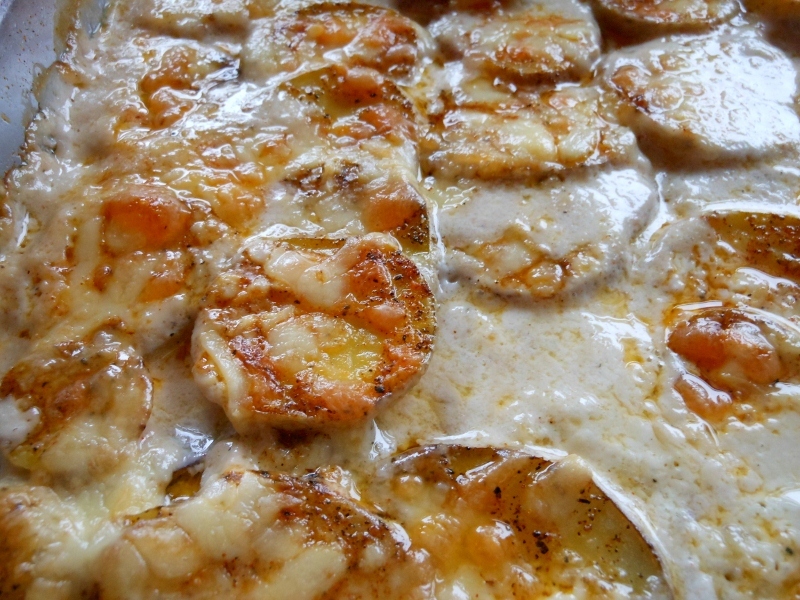 Wash and slice potatoes. I used some baby potatoes I had on hand ~ purple, red, and yellow. Place half of the potatoes in a greased 2 quart casserole. 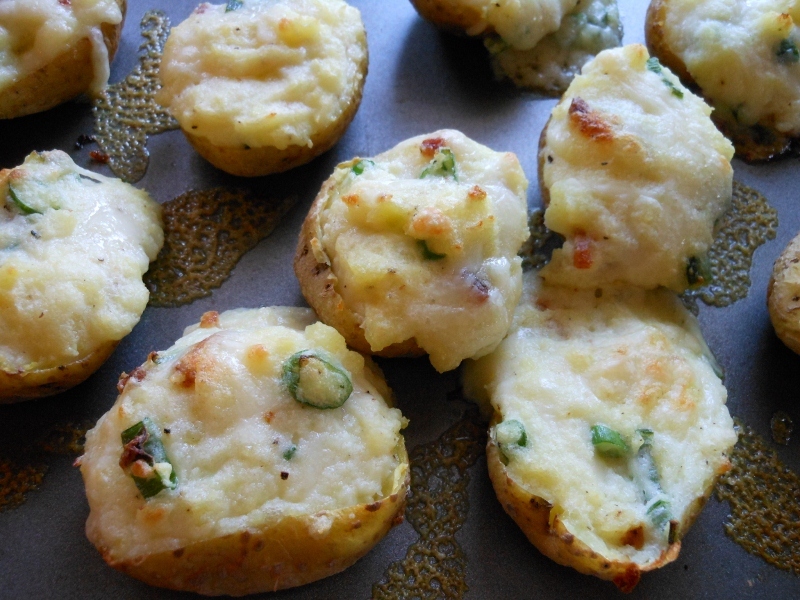 Sprinkle with salt, pepper, garlic; top with 1/2 the cheese and 1/2 the cream. Repeat with remaining ingredients. Ending with cheese on top and a sprinkle of paprika if desired. Bake in 350 degree oven for 30 minutes. Bump heat to 400 degrees and bake another 10 minutes. Allow to rest for 5 minutes ~ the resting is important to set up the sauce.